Every two years since 1981, the Detroit- and Brooklyn-based monthly newsletter Labor Notes has rallied union members and wannabe members, as well as some union staff and elected leaders, to join in a long weekend of sharing stories, strategies and wisdom gained in their workplace skirmishes. They are the sort of people that bosses everywhere—and a few union officials—might call “troublemakers,” and they have adopted the moniker as a badge of honor (including holding “troublemaker schools” and producing tactical handbooks for do-it-yourself organizers). Last weekend, around 2,200 labor activists, from diverse age groups, industries, personal experiences and nations (about 150 visitors from 22 countries), gathered in Chicago for a packed line-up of workshops and plenary sessions in the largest of these conferences. Some workshops focused on learning skills (such as how to figure out the cost of a contract to employers) or tactics (including such oldie-but goodie actions as “salting,” that is, getting pro-union workers hired at businesses that are organizing targets). Conference panels also discussed strategies for particular employers or industries, such as the auto industry or postal service, and how to make the best use of different kinds of strikes and resistance inside the workplace, such as “working to rule,” which effectively slows down production. Other discussions examined the promises and perils of unions forming broader alliances or incorporating social goals in their bargaining and other campaigns (such as teacher unionists opposing privatization or high-stakes testing). Other panels examined global labor developments and socio-economic changes shaping the world of work and new challenges for organized labor, such as climate change. There were opportunities to gain energy, inspiration and a tingle of solidarity with other struggles in even more difficult circumstances than one’s own. Fiery speakers took the stage on behalf of ill-paid ($6 a 12-hour day), frighteningly abused indigenous workers from the southern part of Mexico, who have migrated to work in Baja California, California and Washington state, picking strawberries that are eventually sold under the Driscoll label. And one of the troublemaker awards went to hunger strikers from the community and teachers’ union who went on a hunger strike to prevent the closing of their neighborhood-based Dyett High School. Although the Labor Notes conferences rarely discuss union political strategies, this year more than 100 conference-goers attended each of two meetings discussing the “Labor for Bernie” organizing that is independent of the official Bernie Sanders for president campaign. The Sanders candidacy has generated hope and energy among many unionists, even though many more unions have officially endorsed his Democratic rival, former Secretary of State Hillary Clinton. Labor for Bernie tries to maximize grass-roots support from union members, regardless of the official position of their unions, and to block moves that would increase union support for Clinton. For example, the electrical workers union (IBEW, or International Brotherhood of Electrical Workers) has remained neutral, largely as a result of pro-Bernie advocacy by Carl Shaffer, a former international union representative who returned to his local union in Indiana to seek elected office. In turn, IBEW’s neutrality, according to some labor movement political organizers, played a significant role in blocking an endorsement of Clinton by the AFL-CIO executive council earlier this year. Indeed, many in the group of young workers/intellectuals who started Labor Notes came from the International Socialists, one of the many left splinter groups that identified with the legacy of Leon Trotsky. More than many contemporaneous small left group members, IS members were grounded in significant work within unions (including building one of the more successful union reform groups, Teamsters for a Democratic Union), comparatively open to collaborating with others, and both thoughtful and realistic. Their relative openness made Labor Notes and its gatherings a common ground for independent-minded leftists and workers seeking to be better troublemakers for a boss that was already making trouble for them. Although often shunned or attacked by some union leaders (such as during the 2008 meeting when Michigan Service Employees International Union [SEIU] brought busloads of members to break up the conference awards banquet), other union leaders have worked with them, including the late Tony Mazzocchi; the immediate past president of the Communications Workers, Larry Cohen; and Amalgamated Transit Union president Larry Hanley. Mark Brenner, the current director of Labor Notes, is both a realist and an enthusiast regarding the prospects for unions. Later, as we chatted in the hallway, Brenner expounded: “What I think is that a couple of things are converging. The institutional labor movement recognizes their misplaced confidence in both ‘Change To Win’ and winning the Employee Free Choice Act, whether the plans came from [former SEIU and Change to Win leader Andy] Stern or [former AFL-CIO president John] Sweeney. These grand plans were flawed partly because they were “hatched in headquarters,” he says, not involving members in their design and execution. 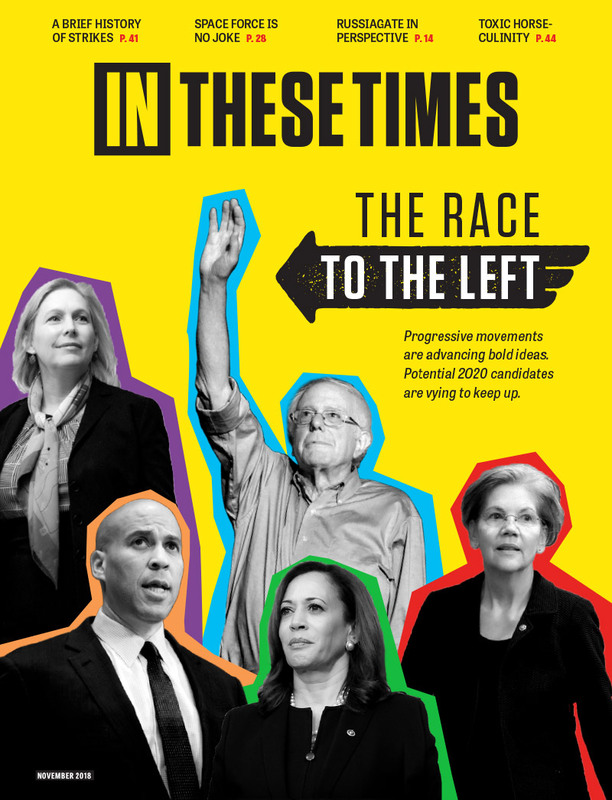 By contrast, he puts hope not only in members who are educated and mobilized but also in the rise of new leaders at various levels in several unions, from the Teamsters and communications workers to teachers’ and nurses’ unions. Many more people have been coming to their schools, and he is especially pleased that “people who have been coming to Labor Notes are running for office and taking over unions,” such as many leaders in the Chicago Teachers Union. “Our focus,” Brenner continues, “is that we want to build powerful movements” where leaders of unions must answer to the members. Labor Notes has always strongly advocated union democracy, rank-and-file direct action and more progressive leadership of unions. But Brenner says the goal of Labor Notes is transforming the labor movement, not electing top officers. “If I could, I would spend all of my time with stewards and local officers,” he says. “It’s hard to transform the labor movement from an elected position.” But it’s also hard to change it when elected leaders are hostile. The goals Labor Notes sets for itself are admirable and necessary for the labor movement. But they are interrelated in ways that often generate tensions that are difficult to resolve (and Labor Notes does not always acknowledge). For example, sometimes members are less progressive than leaders, who may in some cases want to educate the members to be more assertive and militant (even if the opposite situation is more common). And even though conditions for elections in unions often offer less than laboratory-perfect democracy, union members sometimes do elect conservative leaders or are reluctant to take direct actions against employers. Also, unions are both institutions and movements, or at least ideally part of both the labor movement and progressive social and political movements. But tensions easily arise among different needs that reflect these varied roles of unions. access to information. For example, Bill Parker, a Labor Notes stalwart and former Chrysler union local president, described how union staff had much more access to crucial information and discussions between management and union officials than the local elected officials on the bargaining committee that he chaired during national contract negotiations. That imbalance, he said, helped to make it possible for a two-tier wage agreement to be included in a contract even though he and the bargaining committee opposed the two-tier arrangement (which will finally be phased out under the current contract). The history of unions suggests that organizers with the democratic ambitions of Labor Notes often persevere for long periods with little progress, then surge forwards episodically. But that’s not very helpful as a guide to what to do in the interim. It’s much like the answer Kim Moody, one of the founder of Labor Notes who decamped to England to teach labor history, gave to the question posed for his workshop about how general strikes can be started: “When they start, they start,” he says. Since he last visited the United States two years ago, he thinks that “the difference is recognizable, more a feeling of desperation, polarization.” He takes heart from the support for Sen. Bernie Sanders, even the apparent lack of voter discomfort with his defining himself as a socialist, and is appalled at the rise of Donald Trump. “Trump is almost as much a fascist as we’ve seen here, without the funny uniforms,” he says. “The guy’s a thug.” America is beginning to look more like some European countries with political clashes between an anti-immigrant right and populist left movements, like Podemos in Spain or Syriza in Greece, he suggests. And Bernie is America’s counterpart to the new Labour Party leader in the United Kingdom, Jeremy Corbyn. Yet much more is happening in a “subterranean” form in labor and other movements. Like the Highlander Folk School (now Research and Education Center), founded in the South by Myles Horton in 1932, or the Brookwood Labor College, founded in 1921 in New York state under the leadership of A. J. Muste, Labor Notes and its conferences are part of a small, almost subterranean effort to educate workers to create a militant and democratic unionism. The labor movement can only benefit from its work and, one can hope, from others taking up the same cause. $6.00 for a 12hr. day of picking strawberries........! The people of the USA want the pension shortages in the Kroger company, United Partial Service and others to be revealed so familes will not suffer. Republic windows was a winner.THese things are drowned in the money that runs NYC Wisconsin is a close drive so are other important Midwest people.Help with a national jobs program.